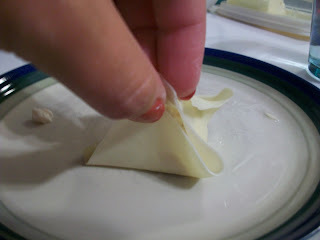 I love eating crab rangoon at restaurants, so when I found this version to make at home, I was ecstatic! A small disclaimer: these are baked and not fried, so the texture is different. I think they would be better fried, but wouldn't most things? However, since they're not fried, their caloric load is greatly reduced, which means you can eat MORE of them. Even though they're not fried, they have the same delectable filling on the inside. 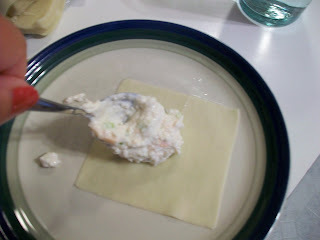 Start by combining the cream cheese, garlic salt and worcestershire sauce. 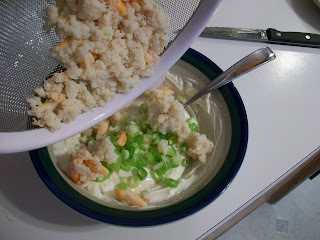 Mix well to combine, then stir in the green onions and crab. 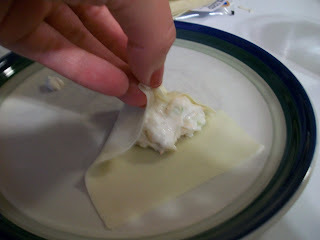 Carefully separate the wonton wrappers. These are thin and they tear easily. Do your best to keep them whole! Spoon about two teaspoons of filling in the middle of the wonton wrapper. Then bring the corners of the wrapper up to seal. You'll probably need to moisten your fingers with water to get the wrapper to seal up - I keep a small glass of water nearby to make this easy. 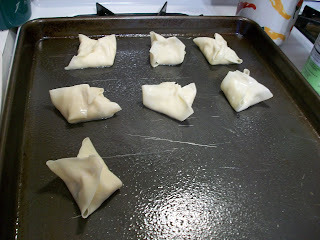 Place the finished wontons on a baking sheet sprayed with nonstick cooking spray. Then lightly spray the tops with more nonstick spray - this will help them crisp up slightly. Bake until golden brown, and serve warm! Note: these do not re-heat well so I recommend eating them all fresh from the oven! Get more cooking inspiration at the Ultimate Recipe Swap, Mouthwatering Mondays, Tempt my Tummy Tuesdays, Tasty Tuesdays, and Tuesdays at the Table. 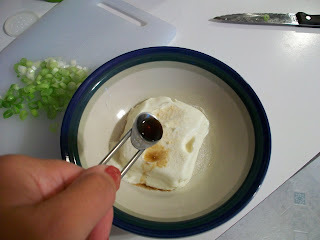 In a small bowl, combine the cream cheese, garlic salt and Worcestershire sauce and stir until smooth. Stir in the onions and crab. Place 2 tsp. full in the center of each wonton wrapper. 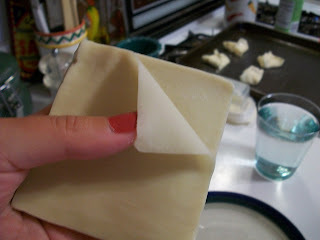 Moisten edges wtih water; bring corners to center over filling and press edges together to seal. Place on a baking sheet coated with cooking spray. Lightly spray wontons with cooking spray. Bake at 425 for 8-10 minutes or until golden brown. Serve warm. 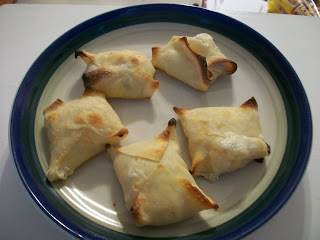 These look so good, I have to try this very soon, thanks bunches !! This recipe is definitely a keeper! I like the fact that they are baked, not fried. Thanks so much for sharing it. Love crab rangoon. This recipe sounds yummy and easy. Thanks. This is great, I'm making this today. Thanks! Looks good.Thanks for joining TMTT this week. Great recipe. I love crab rangoon! Oh, yum!! I can't wait to try these; they are one of my favorites. :-) Thanks for sharing it with TATT! That looks so easy. And such a great alternative to paying a big price for these tasty treats. I can't imagine they would last long outside the oven! I've never had these, but they look yummy! These look great! I am so excited to try them! I love Crab Rangoon. Sounds really good! I must try them.